Petratherm (ASX:PTR) and its JV partners Beach Energy (ASX:BPT) and TRUenergy are delighted to advise that the fracture stimulation undertaken on the Paralana 2 well has been successfully completed. Australian Market Report of October 18, 2010 includes: Marengo Mining (ASX:MGO) signed MOU with China NFC (SHE:000758) for copper-molybdenum-gold project In Papua New Guinea; Tap Oil Limited (ASX:TAP) commenced drilling at Manora-4 appraisal well in Thailand; Encounter Resources Limited (ASX:ENR) reported highest grade copper intersection to date in Western Australia; Petratherm Limited (ASX:PTR) is advancing its 8 MW Madrid Geothermal District Heating project in Spain. Beach Energy Limited (ASX:BPT)(PINK:BEPTF) drilling report for the week ending 16 December, 2009 are attached. Highlights of the week&apos;s activities include: Paralana-2 (GEL 178) has been successfully cased and cemented to a depth of 3725 metres and the rig was released on 12 December. 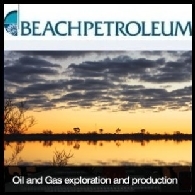 Beach Petroleum Limited (ASX:BPT)(PINK:BEPTF) drilling report for the week ending 9 December. Highlights of the week&apos;s activities include: The running of the 7" casing string at Paralana-2 (GEL 178) has commenced. Well completion and rig release is expected to occur in mid to late December 2009. Beach Petroleum Limited (ASX:BPT)(PINK:BEPTF) The drilling report for the week ending 2 December. Highlights of the week&apos;s activities include: NS377-4 (Teen) is scheduled to spud on 4 December. Operations at Paralana-2 have resumed after a week of waiting on roads to dry following heavy rainfalls in the basin. 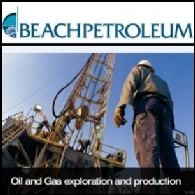 Beach Petroleum Limited (ASX:BPT)(PINK:BEPTF) drilling report for the week ending 25 November. Highlights of the week&apos;s activities include: Production testing of NS377-3 (Beach 20%) Kareem Formation reservoir to provide data about fluid and reservoir properties has been completed. Logging information for Paralana-2 geothermal deep injector well (Beach, well Operator, earning 21%) has been acquired to 3,740m and is currently being evaluated. Beach Petroleum Limited (ASX:BPT)(PINK:BEPTF) drilling report for the week ending 18 November, 2009 are attached. Highlights of the week&apos;s activities include: The upper 5.6 metres of the Namur Sandstone at Chiton-1 (PEL 91, Beach 40%) has been perforated and was flow-tested for an 80 minute period at an average rate of 2434 barrels oil and 226 barrels of water per day. The NS377-3 field development well (Beach 20%) has been cased and production testing to provide data about fluid and reservoir properties has been initiated. Evaluation of the Paralana-2 geothermal deep injector well (Beach, well Operator, earning 21%) has commenced. Beach Petroleum Limited (ASX:BPT)(PINK:BEPTF) drilling report for the week ending 11 November. Highlights of the week&apos;s activities include: The NS377-3 field development well (Beach 20%) has been cased and the 145 metre gross vertical oil column intersected by the well is being perforated for future oil production. The Paralana-2 geothermal exploration well has reached target TD of 4012 metres and the formation evaluation program is being planned. 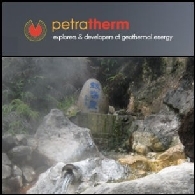 Petratherm Limited (ASX:PTR) is this week hosting a highlevel Chinese delegation working toward developing geothermal energy in China. The group, including the Vice Director of the China Institute of Geo-Environment Monitoring, the Chairman of the Geothermal China Energy Society and the Director of the Fujian Southern Institute of Geothermal and Mineral Spring, have been working with Petratherm through a cooperative agreement. 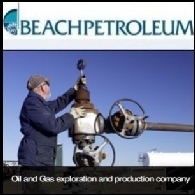 Beach Petroleum Limited (ASX:BPT)(PINK:BEPTF) drilling report for the week ending 28 October. Highlights of the week&apos;s activities include: The NS 394-3 [Burtocal North-1] oil exploration well (Beach 20%) is at a depth of 3224 metres. The current operation is tripping out of hole to change bit prior to drilling ahead towards reservoir target Nubia Formation. The NS 377-3 development well (Beach 20%) is at a depth of 2292 metres. The current operation is preparing to drill ahead towards extended reach target having set 9.625" casing. 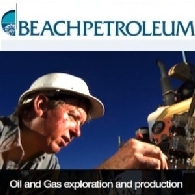 Beach Petroleum Limited (ASX:BPT)(PINK:BEPTF) drilling report for the week ending 21 October. Highlights of the week&apos;s activities include: The NS 394-3 [Burtocal North-1] oil exploration well (Beach 20%) is at a depth of 2998 metres. Current operation is rig repairs. The NS 377-3 development well (Beach 20%) is drilling ahead at a depth of 1601 metres towards its extended reach target. 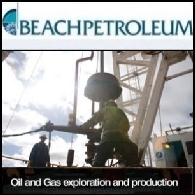 Beach Petroleum Limited (ASX:BPT)(PINK:BEPTF) drilling report for the week ending 14 October. Highlights of the week&apos;s activities include: The NS 394-3 [Burtocal North] oil exploration well (Beach 20%) is drilling ahead at a depth of 2923 metres towards the primary reservoir objective Nubia Formation. The NS 377-3 production well (Beach 20%) is at a depth of 1198 metres. The current operation is preparing to drill ahead towards its extended reach target, having installed 13 3/8" casing. 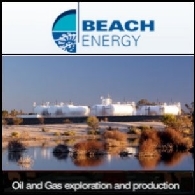 Beach Petroleum Limited (ASX:BPT)(PINK:BEPTF) drilling report for the week ending 7 October. Highlights of the week&apos;s activities include: The NS 394-3 [Burtocal North] oil exploration well (Beach 20%) is drilling ahead at a depth of 2725 metres towards the primary reservoir objective Nubia Formation. 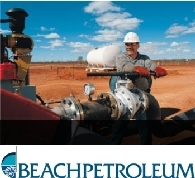 Beach Petroleum Limited (ASX:BPT)(PINK:BEPTF) drilling report for the week ending 30 September. Highlights of the week&apos;s activities include: The NS 394-3 [Burtocal North] oil exploration well (Beach 20%) is drilling ahead at a depth of 2117 metres in the South Gharib Formation. Wakefield-1 (Beach 23.33% in Post Permian JV), has been cased and suspended pending further evaluation to establish whether commercial hydrocarbons have been intersected by the well. Beach Petroleum Limited (ASX:BPT)(PINK:BEPTF) drilling report for the week ending 23 September, 2009 are attached. Highlights of the week&apos;s activities include: Wakefield-1 (Beach 23.33% in Post Permian JV), targeting oil in the Namur and Hutton Sandstones, has reached total depth at 2298 metres in the Nappamerri Formation and is preparing to run wireline logs. The NS 394-3 [Burtocal North] offshore oil exploration well (Beach 20%) has reached a depth of 1315 metres and is running intermediate casing. Beach Petroleum Limited (ASX:BPT)(PINK:BEPTF) drilling report for the week ending 16 September 2009, highlights of the week&apos;s activities include: Spikey Beach-1 (Beach 80% in Spikey Beach Farmout Blocks) targeting oil in the Upper Eastern View Group reached final total depth of 2100m MDRT on 14 September. The NS 394-3 [Burtocal North] offshore oil exploration well (Beach 20%) is drilling ahead at a depth of 672 metres after spudding on 14 September. Wakefield-1 (Beach 23.33% in Post Permian JV), targeting oil in the Namur and Hutton Sandstones, spudded Thursday 10 September. Beach Petroleum Limited (ASX:BPT)(PINK:BEPTF) drilling report for the week ending 9 September, highlights of the week&apos;s activities include: Wakefield-1 (Beach 23.33% in Post Permian JV), targeting oil in the Namur and Hutton Sandstones is expected to spud Thursday 10 September. Spikey Beach-1 (Beach earning 80% in Spikey Beach Farmout Blocks) spudded on 5 September and is currently at a depth of 816 metres. The Comet drilling rig is being jacked up over the NS394-3 [Burtocal North] oil exploration well (Beach 20%) location. 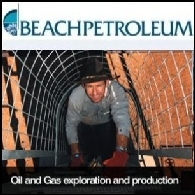 Beach Petroleum Limited (ASX:BPT)(PINK:BEPTF) drilling report for the week ending 12 August, 2009. 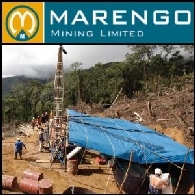 Highlights of the week&apos;s activities include: Marino-1 (Beach 40%) spudded on 22 August and is currently drilling ahead in the Toolebuc Formation at a depth of 1003 metres. Basker-7 (Beach 30%) has been cased and suspended as a future Latrobe Group oil producer. Beach Petroleum Limited (ASX:BPT)(PINK:BEPTF) announces the drilling report and well location maps for the week ending 12 August, 2009. Highlights of the week&apos;s activities include: Chiton-1 is drilling ahead at a depth of 887 metres in the Allaru Mudstone. Burnside-1ST1 (Beach 7.34%) is being plugged and abandoned as planned. Basker-7 (Beach 30%) has reached total depth of 3921 metres. 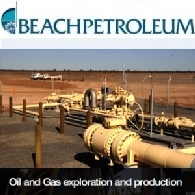 Beach Petroleum Limited (ASX:BPT)(PINK:BEPTF) announces the drilling report for the week ending 22 July, 2009. Murninnie-1 (PEL 92, Beach 75%), has been plugged and abandoned. The Ensign 30 rig is being moved to the Chiton-1 well location in adjacent Licence PEL 91. In areas operated by Santos, Charo-4 (Beach 20.21%) has been plugged and abandoned. Basker-7 (Beach 30%) is drilling ahead at a depth of 3920 metres. Beach Petroleum Limited (ASX:BPT)(PINK:BEPTF) announces the drilling report for the week ending 22 July, 2009. Murninnie-1 (Beach 75%) spudded on 24 July and is drilling ahead in the Murta Formation at a depth of 1399m. In areas operated by Santos, one well is in progress (Charo-4, Beach 20.21%). 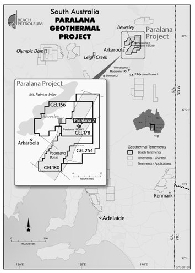 The Paralana-2 geothermal exploration well (Beach earning 21%) is drilling ahead at a depth of 1069 metres. Basker-7 (Beach 30%) spudded on 21 July and is drilling ahead at a depth of 2512 metres. 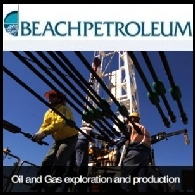 Beach Petroleum Limited (ASX:BPT)(PINK:BEPTF) announces the drilling report for the week ending 22 July, 2009. Highlights of the week&apos;s activities include: Willunga-1 (Beach 75%) has been plugged and abandoned after wireline logs confirmed the absence of commercial volumes of hydrocarbons in the well. The Paralana-2 geothermal exploration well (Beach earning 21%) is drilling ahead at a depth of 796 metres. 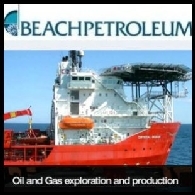 Beach Petroleum Limited (ASX:BPT)(PINK:BEPTF) drilling report for the week ending 8 July, 2009. The Ensign 30 rig will be moved to the Willunga-1 location, also in PEL 92 and located 15 km north west of the Parsons oil field. The Paralana-2 geothermal exploration well is currently drilling ahead at a depth of 480 metres in the Maree Formation. Burnside-1 has been sidetracked due to mechanical issues. Burnside-1ST1 is drilling ahead at a depth of 2320 metres. 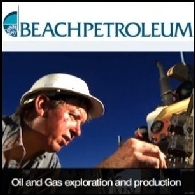 Beach Petroleum Limited (ASX:BPT)(PINK:BEPTF) announces the drilling report for the week ending 1 July, 2009. Beach Petroleum Limited&apos;s (ASX:BPT)(PINK:BEPTF) Butlers-1, the third well of a planned six well oil exploration program in PEL 92 is to be cased and suspended after intersecting a 4.5 metre oil column in high quality reservoir at the top of the Namur Sandstone. Butlers-1 is the second successive oil discovery in the current drilling campaign. 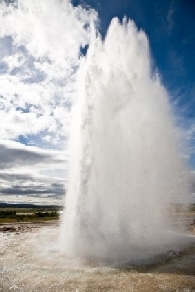 In the face of the current economic downturn, the Australian geothermal industry has experienced significant growth in the number of companies that have joined the search for "Hot-Rock Energy", fuelled by the rapidly increasing demand for renewable energy. In the nine months since the Australian geothermal industry launched the world&apos;s first Geothermal Reporting Code, six companies have reported massive geothermal energy reserves. Petratherm Ltd (ASX: PTR) - 2007 Annual General Meeting - Mr Terry Kallis, MD; Petratherm Ltd (ASX: PTR) present the following audio webcast regarding "2007 Annual General Meeting". You may also download this audio webcast to your computer or portable audio player. Petratherm (ASX: PTL) is pleased to announce that it has been awarded an extensive Geothermal Exploration License (GEL), covering an area of 330 square kilometres, located approximately 40 kilometres NNE of Madrid (refer Attachment for background and technical detail). Petratherm Ltd (ASX: PTR) - Geothermal Exploration Licence in the Madrid Basin Secured - Mr Terry Kallis, MD; Petratherm Ltd (ASX: PTR) present the following audio webcast regarding "Geothermal Exploration Licence in the Madrid Basin Secured". You may also download this audio webcast to your computer or portable audio player. Petratherm Ltd (ASX: PTR) - $50 million Coalition Election Commitment to Petratherm - Mr Terry Kallis, MD; Petratherm Ltd (ASX: PTR) present the following audio webcast regarding "$50 million Coalition Election Commitment to Petratherm". You may also download this audio webcast to your computer or portable audio player. The Federal Coalition today announced a $50 million election commitment to accelerate the commercialization of Petratherm&apos;s (ASX: PTR) Paralana Geothermal Energy Project in South Australia&apos;s northern Flinders Ranges. Petratherm Ltd (ASX: PTR) - Fifth Spanish Project secured in the Almazan Basin - Mr Terry Kallis, MD; Petratherm Ltd (ASX: PTR) present the following audio webcast regarding "Fifth Spanish Project secured in the Almazan Basin". Petratherm Ltd (ASX: PTR) - Paralana & Gran Canaria Update - Mr Terry Kallis, MD; Petratherm Ltd (ASX: PTR) present the following audio webcast regarding "Paralana & Gran Canaria Update". You may also download this audio webcast to your computer or portable audio player. Petratherm Ltd (ASX: PTR) - New Spanish Conventional Geothermal Project, Gran Canaria - Mr Peter Reid, Operations Manager; Petratherm Ltd (ASX: PTR) present the following audio webcast regarding "New Spanish Conventional Geothermal Project, Gran Canaria". You may also download this audio webcast to your computer or portable audio player. Petratherm Ltd (ASX: PTR) - Hot Rocks Presentation - Mr Terry Kallis, MD; Petratherm Ltd (ASX: PTR) present the following audio webcast regarding "Hot Rocks Presentation". You may also download this audio webcast to your computer or portable audio player. Petratherm Ltd (ASX: PTR) - Renewable Energy Briefing to Linwar Securities - Mr Jonathan Teubner, Bus. Dev. Manager; Petratherm Ltd (ASX: PTR) present the following audio webcast regarding "Renewable Energy Briefing to Linwar Securities". You may also download this audio webcast to your computer or portable audio player. Petratherm Ltd (ASX: PTR) - New Conventional Geothermal Project in Tenerife, Spain - Mr Terry Kallis, MD; Boardroomradio is pleased to announce that Petratherm Ltd (ASX: PTR) has published an audio file. Petratherm Ltd (ASX: PTR) - Spanish Media Group takes Stake in Petratherm - Mr Terry Kallis, MD; Boardroomradio is pleased to announce that Petratherm Ltd (ASX: PTR) has published an audio file. Petratherm Ltd (ASX: PTR) - Presentation to ABN AMRO Clean & Green Conference - Mr Terry Kallis, MD; Boardroomradio is pleased to announce that Petratherm Ltd (ASX: PTR) has published an audio file. Petratherm Ltd (ASX: PTR) - Broadens Business Focus - Mr Terry Kallis, MD; Boardroomradio is pleased to announce that Petratherm Ltd (ASX: PTR) has published an audio file. Petratherm Ltd (ASX: PTR) - Uniquely Positioned in the Geothermal Sector - Mr Terry Kallis, MD; Boardroomradio is pleased to announce that Petratherm Ltd (ASX: PTR) has published an audio file. Petratherm Ltd (ASX: PTR) - Second Geothermal Energy Project in Spain - Mr Terry Kallis, MD; Boardroomradio is pleased to announce that Petratherm Ltd (ASX: PTR) has published an audio file. Petratherm Ltd (ASX: PTR) - New Geothermal Energy Project near Renmark - Mr Peter Reid, Operations Manager; Boardroomradio is pleased to announce that Petratherm Ltd (ASX: PTR) has published an audio file. Petratherm Ltd (ASX: PTR) - $5m Grant for Paralana Project - Mr Terry Kallis, MD; Boardroomradio is pleased to announce that Petratherm Ltd (ASX: PTR) has published an audio file. Petratherm Limited (ASX: PTR) is set to become the first Australian company to formally develop hot rock and conventional geothermal energy projects in Spain. Petratherm Ltd (ASX: PTR) - New Geothermal Project Sites in Spain - Mr Terry Kallis, MD; Boardroomradio is pleased to announce that Petratherm Ltd (ASX: PTR) has published an audio file. A new geothermal or "hot rock" energy joint venture potentially worth tens of millions of dollars has been announced between Petratherm Limited (ASX: PTR) and Beach Petroleum Limited (ASX: BPT). There has been further endorsement of Petratherm Limited&apos;s emerging Paralana hot rock discovery in northern South Australia, with new data reinforcing the long-term heat potential for the geothermal field. An Australian company has won the right to help China best determine if, how and where geothermal or "hot rocks" generated power can help service that country&apos;s emergence as the world&apos;s fastest growing market for electricity. 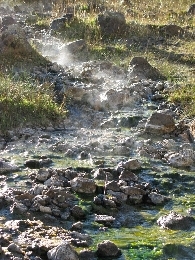 The operating Beverley uranium mine in South Australia may take future electricity supplies from a geothermal or "hot rocks" source in South Australia. Australia&apos;s emerging geothermal energy sector has been boosted with confirmation from new tests that Petratherm&apos;s (ASX: PTL) South Australian exploration well has officially recorded one of the country&apos;s highest "hot rocks" temperatures at levels much closer to surface than previous such wells. 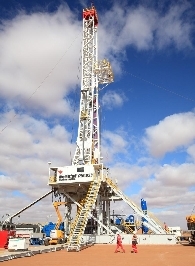 Geothermal or hot rock energy developer, Petratherm Limited (ASX: PTR), said today it had now successfully completed the drilling of the Paralana-1 well in the State&apos;s north, to the target depth of 1,807 metres. Petratherm is pleased to announce that drilling began late Saturday 20th May, to deepen its promising geothermal well at Paralana. Addressing the first day today of the "2006 Paydirt SA Resources @ Energy Investment Conference" being held in Adelaide, listed hot rocks specialist, Petratherm Limited (ASX: PTR), said resumption of drilling would commence at its Paralana-1 well within a fortnight. The board of Petratherm Ltd (ASX: PTR) is pleased to announce the appointment of Mr. Terry Kallis as Managing Director effective from today the 1st May 2006. Mr. Kallis will be joining Petratherm following a very successful and highly regarded career in the Australian Electricity Industry both as a consultant and senior executive. Petratherm Limited (ASX: PTR) today announced that 5.25 million ordinary shares are to be placed by Taylor Collison Ltd and Lands Kirwan Tong Stockbrokers Pty Ltd. The placement is to be made at 28 cents per share and is conditional upon Minotaur Exploration Ltd (Minotaur) exercising $500,000 of its options in Petratherm. Minotaur has advised that it intends to exercise the options subject to the escrow conditions presently in place.